The Fourth » Then Ecta condensed into a black hole. Then Ecta condensed into a black hole. 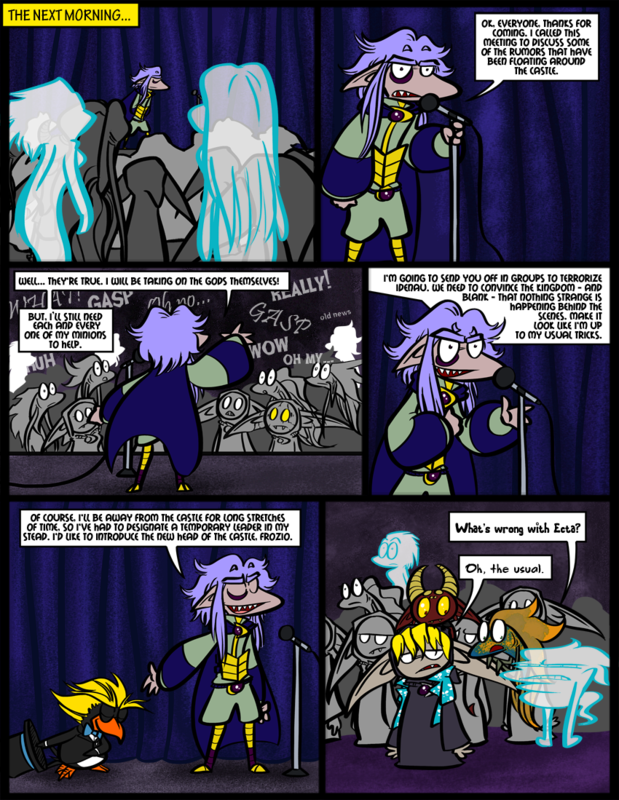 Sharkey and Angus are in this comic, our minions of Skärva provided by readers! I’m making an effort to put them in more. HEY GUYS I have a job interview today, and I am… nervous. Trying not to be but I am going to be, a bit. Lend me your strength. Good luck, Courtney! We believe in you! Thanks! I think I did pretty well, but it’s out of my hands now! I think I found Sharkey (panel 3, bottom right), but cannot for the life of me find Angus! On the far left in the same panel. It’s hard to tell without color though. But that’s him. I’ll put him in one of the upcoming comics in full flish resplendency. Poor Ecta; she’s feeling Snape’s pain about now. Good luck! I know how stressful it is, trust me. Hahah. Ecta wanted to be the next Defense Against the Light Arts teacher! INDEED. I think I did pretty well, but I can only hope I’m what they’re looking for! I love these characters. I really do. I love the shading effect on the curtains. Captcha: Table Opresor. Captcha is oppressing tables? It wouldn’t surprise me, but I’m sure the tables will turn. Where are you applying at? But really, the more I talk about it and how much I would like to work there, the harder it will be for me if I don’t get the job… so I’ll keep it on the down-low for now. But I’ll be sure to let you guys know if I get it! Aww just noticed Floyd is letting Davis sit on his head for a better view, how cute. Floyd gives the best piggy-back rides. From temple tour guide to (intrim) Master of Evil, Frozio is moving up in the world! I do wonder what the penguin people(? )’s relationship with the gods is. They seem to have no problem with opposing the God’s champion. Indeed! And he deserves it after that “interview” process. Maybe we’ll make an encyclopedia entry on penguins sometime. Frozo’s hair in this comic reminds me of Skarva. Is somebody trying to impress a certain bad guy? I didn’t realize Skarva employed any Thwomps. Good luck on the interview! Ecta would be a really ineffective Thwomp. Is that Ecta saying “old news” in the third panel? They are magnificent curtains, what are you saying? Yes indeed Imagine a level of smugness on her face so intense that it cannot be shown. It is as if all of the ego left Ecta and she collapsed into herself due to the mass quantities of ego leaving her. That or she is depressed. Eh? EH? I went through an interview a few weeks ago and did fine and got the job. If I could get through one without being nervous, so can you. Believe in the fans that believe in you! Well hey, congrats! And thank you guys for all your support, it certainly put me in a good mood this morning. ecta is a zylaphone. can i play her? lol xylaphone. oh and victor what is your favorite pie?? Haha, I don’t see how Ecta looks like a xylophone or a xylaphone OR a zylaphone. But she DOES remind me of an accordion… maybe Cyril can play her. why isn’t skarva where the medallion? is it looked up in a hidden safe? we wouldn’t want a certain bard to lose it would we? He doesn’t want to wear it TOO much, considering it’s spent so long around Cyril’s neck. Oh! Let’s give a name to this form of Ecta! It sounds like you’re performing some bizarre chant or magic spell of ghost-squishing. I was thinking about this scene: https://www.youtube.com/watch?v=dd2Zcbl9_iU except it’s sad instead of hopeful. Aww! We really need to get around to watching that someday. Good luck, Courtney! We all believe in you!! *Sorry, didn’t mean to repeat what anybody had already said. I rushed down to make a comment without looking at anyone else’s first. Oops. Haha, no problem! Thank you! I’m not going to say no to encouragement. Waiting is hard! I love that Blues Brothers gravatar you got there, Soul Man, it is one of the best movies EVER. The university band that me and Victor are in, is themed around the Blues Bros… no kidding. Which makes me question of Soul Man is someone we know IRL, or if it’s just another wonderful coincidence of the universe. Sharkey my boy! I didn’t spot you without the yellow eyes! I have absolutely no idea why but I love the second panel. Dunno if it’s his posture or the look on his face, but the panel just tickles me for some reason. Oh, crap, that’s right! I’ll fix it tonight, then he’ll really stand out! No, that’s an important part of his character design but I derped, so by all means call me out – you donated, after all! Thanks! I’m crossing my fingers, knocking on wood, putting broken mirrors back together, and closing umbrellas indoors. New Skärva Puffs, the breakfast of villains! Now with marshmallow Ectas! Now we just need to convince blank to buy it and the evil plot will be complete. I literally burst out laughing from that, so glad I wasn’t in a library or anything at the time.